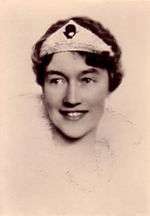 Charlotte (Charlotte Adelgonde Élise/Elisabeth Marie Wilhelmine; 23 January 1896 – 9 July 1985) reigned as Grand Duchess of Luxembourg from 1919 to 1964. Born in Berg Castle, Charlotte of Nassau-Weilburg, Princess of Luxembourg, was the second daughter of Grand Duke William IV and his wife, Marie Anne of Portugal. When her older sister, Marie-Adélaide, who had succeeded their father, was forced to abdicate on 14 January 1919, Charlotte became the one who had to deal with the revolutionary tendencies in the country. Unlike her sister, she chose not to interfere in its politics. 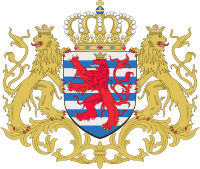 In a referendum about the new constitution on 28 September 1919, 77.8% of the Luxembourgish people voted for the continuation of a Grand Ducal monarchy with Charlotte as head of state. 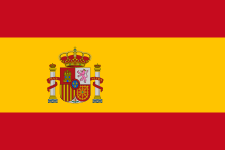 In this constitution, the power of the monarch was severely restricted. During the German occupation of Luxembourg in World War II, Charlotte, exiled in London, became an important symbol of national unity. 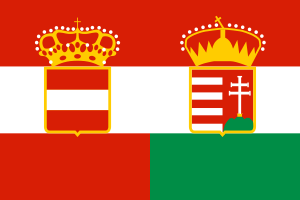 Princess Elisabeth, Duchess von Hohenberg 22 December 1922 22 November 2011(2011-11-22) (aged 88) Franz, Duke von Hohenberg (1927–1977), and had issue. Princess Marie Adelaide, Countess Henckel von Donnersmarck 21 May 1924 28 February 2007(2007-02-28) (aged 82) Count Karl Josef Henckel von Donnersmarck (1928–2008), and had issue. Princess Marie Gabriele, Dowager Countess af Holstein-Ledreborg (1925-08-02) 2 August 1925 Knud Johan, Count af Holstein-Ledreborg (1919–2001), and had issue. Prince Charles of Luxembourg 7 August 1927 26 July 1977(1977-07-26) (aged 49) Joan Douglas Dillon (b. 1935), with issue..
Alix, Dowager Princess de Ligne (1929-08-24) 24 August 1929 Antoine, 13th Prince de Ligne (1925–2005), and had issue. 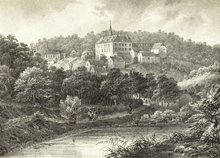 By 1935, Charlotte had sold her German properties, the former residential palaces of the Dukes of Nassau, Biebrich Palace and Weilburg Castle, to the State of Prussia. 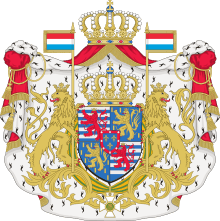 During the Second World War the grand ducal family left Luxembourg shortly before the arrival of Nazi troops. Luxembourg's neutrality was violated on 9 May 1940, while the Grand Duchess and her family were in residence at Colmar-Berg. That day she called an extraordinary meeting of her leading ministers, and they all decided to place themselves under the protection of France, described by the Grand Duchess as a difficult but necessary decision. Initially the family took up residence at the Château de Montastruc in south-western France, but the rapid advance of the German forces into France followed by French capitulation the next month caused the French government to refuse any guarantee of security to the exiled Luxembourg government. 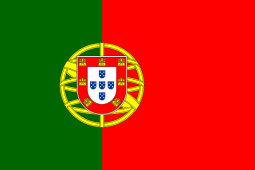 Permission was received to cross Spain provided they did not stop en route, and the Grand Duchess with her ministers moved on to Portugal. The Germans proposed to restore the Grand Duchess to her functions, but Charlotte refused, mindful of her sister's experiences of remaining in Luxembourg under German occupation during the First World War. By 29 August 1940 Grand Duchess Charlotte was in London where she began to make supportive broadcasts to her homeland using the BBC. Later she travelled to the United States and to Canada. Her children continued their schooling in Montreal while she had several meetings with President Roosevelt who encouraged her itinerant campaigning across the country in support of his own opposition to isolationism which was a powerful political current until the Pearl Harbor attacks. 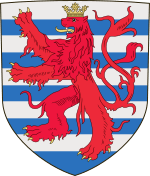 In the meantime Luxembourg, along with the adjacent French Moselle department, found itself integrated into an expanded Germany under the name Heim ins Reich, which left Luxembourgers required to speak German and liable for conscription into the German army. 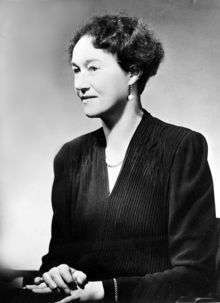 In 1943 Grand Duchess Charlotte and the Luxembourg government established themselves in London: her broadcasts became a more regular feature of the BBC schedules, establishing her as a focus for the resistance movements in Luxembourg. The Grand Ducal family went to North America in exile, settling in Montreal. The Grand Duchess visited Washington DC and made a good will tour of the US to keep the profile of Luxembourg high in the eyes of the Allies. Charlotte's younger sister Antonia and brother-in-law Rupprecht, Crown Prince of Bavaria, were exiled from Germany in 1939. In 1944, living now in Hungary, Crown Princess Antonia was captured when the Germans invaded Hungary and found herself deported to the concentration camp at Dachau, being later transferred to Flossenbürg where she survived torture but only with her health badly impaired. Meanwhile, from 1942 Grand Duchess Charlotte's eldest son, Jean, served as a volunteer in the Irish Guards. In the years after the war, Charlotte showed a lot of public activity which contributed to raising Luxembourg's profile on the international stage, by hosting visits from foreign heads of state and other dignitaries, such as Eleanor Roosevelt (1950), Queen Juliana of the Netherlands (1951), René Coty (1957), King Baudouin of Belgium (1959), King Bhumibol of Thailand (1961), and King Olav V of Norway (1964). Likewise, she visited Pius XII (1950), Charles de Gaulle (1961), and John F. Kennedy (1963). 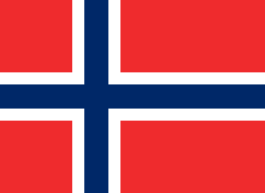 In 1951 Charlotte by decree admitted into the nobility of Luxembourg three Swedish relatives who were not allowed to use their birth titles in Sweden. She then named them as Sigvard Prince Bernadotte, Carl Johan Prince Bernadotte and Lennart Prince Bernadotte and also gave them and their legitimate descendants the hereditary titles of Counts and Countesses of Wisborg there. On 12 November 1964, she abdicated in favour of her son Jean, who then reigned until his abdication in 2000. Charlotte died at Schloss Fischbach on 9 July 1985, from cancer. She was interred in the Ducal Crypt of the Notre-Dame Cathedral in the city of Luxembourg. A statue of the Grand Duchess is in Place Clarefontaine in the city of Luxembourg. 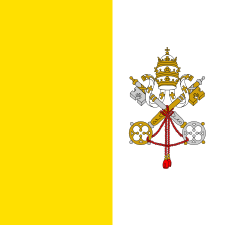 Holy See: Cross of Honour of the "Pro Ecclesia et Pontifice"
↑ "Grand Duchess Charlotte's US Good-Will-Tours". Luxemburger Wort. 14 April 2015. Retrieved 21 December 2015. ↑ "Commemoration to mark return of Luxembourg monarch". Luxemburger Wort. 11 April 2015. Retrieved 21 December 2015. 1 2 3 4 "Grand Duchess Charlotte of Luxemburg". alexanderpalace.org. ↑ "The Royal Order of Sartorial Splendor: Wedding Wednesday: November Brides". orderofsplendor.blogspot.co.uk. Wikimedia Commons has media related to Charlotte, Grand Duchess of Luxembourg.